Moose Patio Door – The Moose Patio Door is one of the Strongest Patio Doors in Canada. The Moose Patio Door has multiple chambers for increased strength and performance. The Moose is available in triple glazed glass (1 3/8”) for added security and energy efficiency. This heavy duty construction allows the Moose to be one of the strongest patio doors on the market. The new bold screen design was created to eliminate bending and flexibility. The screen has a large extruded frame for increased rigidity and easy operation. Your screen door will slide open and closed with ease and grace. A wide range of decorative grilles and energy-smart glazing options are available to give your door a custom-designed look. Available in 2, 3 and 4 Panel Configurations. 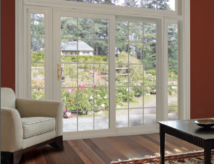 Options from single glazed aluminum doors for seasonal sun rooms, to the most efficient vinyl and wood patio doors. Motorized Screens available for the bi-fold door and other screened porch requirements. Unique locking handle with anti jimmy bar built into mortise lock. Multi-point locks, keyed locks, and foot bolts locking device are also available. Thermal glazing is available with energy smart options like low E, Cardinal LoE 180, LoE 272, and LoE 366 and argon gas fill.